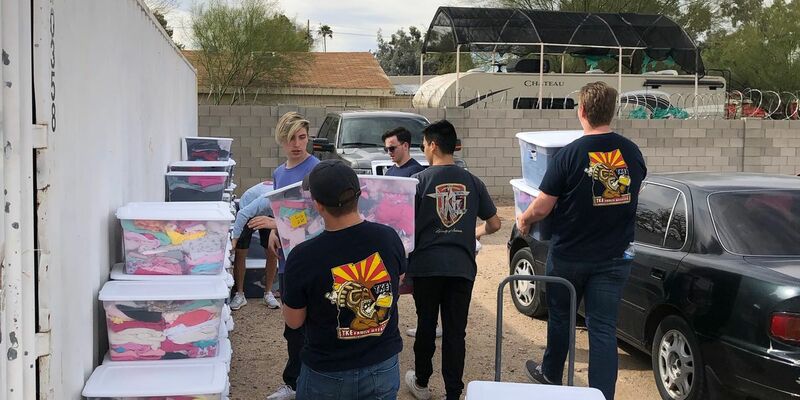 TUCSON, AZ (KOLD News 13) - University of Arizona fraternity Tau Kappa Epsilon (TKE) partnered with More Than a Bed (MTaB) non-profit organization to move warehouse supplies on Saturday, March 23. MTaB non-profit organization supports foster family and adopted family needs by giving them beds, clothes, diapers, household goods and other materials. The warehouse was filled with totes holding winter clothes that needed to be moved out and replaced with summer supplies held in the on-site storage pod. TKE moved the winter items out and brought the summer totes into the warehouse -- a philanthropic event for them. The current volunteer staff of MTaB consisted of mostly women, making the fraternity moving force a “godsend” for the non-profit, said Victor Bellino, a volunteer and co-coordinator for MTaB and an adviser to the local TKE chapter. “They would have had tremendous difficulty moving the massive amount of winter inventory from the showroom floor to the storage container and simultaneously moving all the summer inventory from the storage container into the showroom,” Bellino said. Watching the 12 fraternity members give up a Saturday morning made Bellino proud on a deeper level since he was a member of TKE when he attended University of Arizona, graduating in 1982. The feelings of gratitude were reciprocated by both groups. “It seems that all of us left More Than a Bed with the same awesome feeling of pride and commitment to our community,” said Jared Beckham, TKE Chapter President. MTaB, located at 3637 N 1st Ave. Tucson, Arizona, accepts donations.